The Holidays are here which means there can't be a worse time to get caught drinking and driving. Many people will be attending holiday parties and there's a way to keep safe if you will be drinking during that time. Liferide is a safe alternative for those who choose to drink and get home safely when you've had too much to drink. Here's how it works: Starting Friday, from 5 p.m. to 3 a.m. New Year's Day, those needing a ride home can call 330-376 RIDE. A Yellow Cab will meet you at an area restaurant or bar to take you home. This is not intended as a shuttle from party to party or to take you from home to the party. Private parties are do not qualify as well. You must have a valid driver's license and proof of your home address. Only one ride per person. 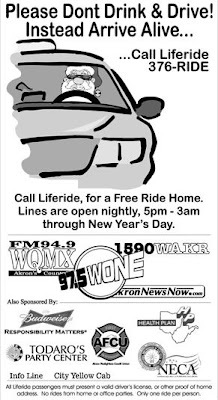 AkronNewsNow along with the Akron Radio Center wants to have a good time this holiday season, so select a designated driver or call Liferide.